Description: This monthly book group will be reading page turning books you just can't put down. Book to be discussed - Bitter Sweets by Roopa Farooki. Roopa Farooki , Bitter Sweets. Mohammed Hanif reads from A Case of Exploding Mangoes. ; Roopa Farooki reads from Corner Shop. 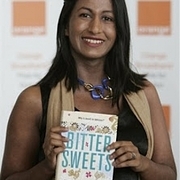 Roopa Rarooki's novels include Bitter Sweets and her new novel Corner Shop, released October 2008. Roopa Farooki's book Half Life was available from LibraryThing Early Reviewers. Roopa Farooki's book Bitter Sweets was available from LibraryThing Early Reviewers. Roopa Farooki is currently considered a "single author." If one or more works are by a distinct, homonymous authors, go ahead and split the author. Roopa Farooki is composed of 2 names. You can examine and separate out names.